NAY PYI TAW, Myanmar, March 20 (PNA) -- President Rodrigo Roa Duterte met with Myanmar President U Htin Kyaw at the Presidential Palace in his first official visit here, which is expected to forge deeper bilateral ties between the two countries. Upon his arrival at the Presidential Palace, President Duterte was warmly received by President U Htin Kyaw in a simple ceremony at the Palace grounds. The President wore a Barong Tagalog while President U Htin Kyaw wore the longyi, Myanmar's traditional costume. The two leaders then proceeded inside the Palace, where President Duterte signed the guest book. The two leaders then held a bilateral meeting, where President U Htin Kyaw said he appreciates the visit of President Duterte to Myanmar. President Rody Duterte meets with State Counsellor Aung San Suu Kyi at the Presidential Palace in Nay Pyi Taw on the second day of his official visit to the Republic of the Union of Myanmar on March 20, 2017. The two leaders are expected to discuss regional cooperation as the Philippines chairs the Association of Southeast Asian Nations (ASEAN) Summits this year and leads the 50th founding anniversary of the regional bloc. President Duterte’s trip to Myanmar is an introductory visit since being elected as the country’s 16th Chief Executive. 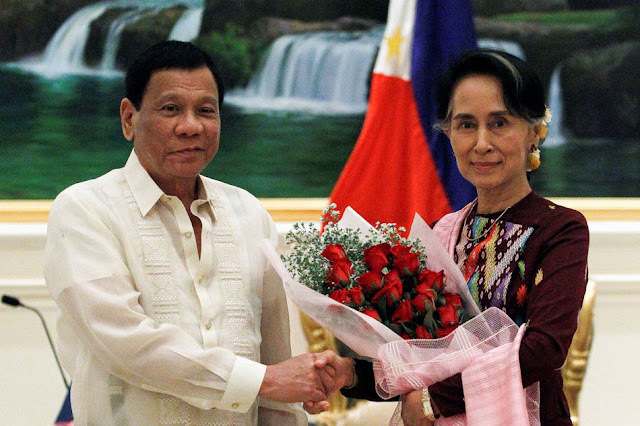 President Duterte then thanked the Myanmar leader for the warm welcome he and his delegation had received in his first official visit to the country. Also present at the bilateral meeting were Agriculture Secretary Emmanuel Piñol, Acting Foreign Affairs Secretary Enrique Manalo, Defense Secretary Delfin Lorenzana, Communications Secretary Martin Andanar, Trade and Industry Secretary Ramon Lopez, Chief Presidential Legal Counsel Salvador Panelo, National Security Adviser Hermogenes Esperon, Jr., Philippine Ambassador to Myanmar Alex Chua, and Senators Alan Peter Cayetano and Vicente Sotto III. Following the bilateral meeting, President Duterte witnessed the signing of a Memorandum of Understanding on Food Security and Agricultural Cooperation, which was signed between the Philippines' Department of Agriculture and Myanmar’s Ministry of Agriculture, Livestock and Irrigation. The President also met with State Counsellor Daw Aung San Suu Kyi at the Call Room of the Presidential Palace. In the said meeting, President Duterte also handed over a pledge worth USD 300,000 to Daw Aung San Suu Kyi for the Philippines' humanitarian assistance to Myanmar's Rakhine State, the biggest donation made so far made by an ASEAN member state to Myanmar's Rakhine State this year. It will be recalled that Myanmar was also the first to help the Philippines when the country was hit by super typhoon Yolanda in 2013. Myanmar's former president U Thein Sein was also the first to visit Bantayan island in Cebu after it was devastated by super typhoon Yolanda.